Australian CIOs continue to embrace digital transformation strategies at accelerated rates and increasingly recognise they need to transform data into actionable intelligence to succeed. Now more than ever, CIOs need to enable smarter decision-making, strengthen customer relationships and drive growth - and are turning to the power of business intelligence, advanced analytics - and even artificial intelligence - to achieve real-world tangible results. 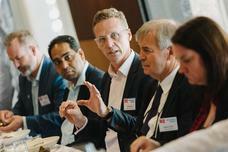 A group of IT leaders gathered in Sydney to discuss their challenges and opportunities in the business intelligence and data analytics journey. Executing an effective business intelligence (BI) strategy is at the front of many CIO's minds as their organisations rely more and more on data to make decisions. But many of these IT leaders are making the wrong assumptions about BI, says Gartner research director Svetlana Sicular. Facebook has released Presto -- a distributed SQL query engine optimized for running ad-hoc interactive queries on data sources up to petabytes in size -- to the open source community under the Apache license. It says Presto is 10x better than Hive. Big Data is clearly a disruptive technology, but using it successfully is as much art as it is science. The key is integrating Big Data with traditional BI to create a data ecosystem that allows you to generate new insights while executing on what you already know. Business intelligence (BI) is frequently among the top prioroties for CIOs and finding the right software to do the job is always a challenge. Cloud-based software may be all the rage, but CIOs must still manage in-house information and make better use of it through analytics and reporting tools. The big four software companies have all made strategic investments in the BI space over recent years and the options have dimnished, but there are alternative tools popping up and snatching a lot of customers in the process. This installment of '5 open source things to watch' is all about BI that doesn't scar the annual report. This report provides an excellent view of cloud-based analytics and business intelligence strategies around the globe in terms of strategy, project implementation, and horizontal infrastructure.